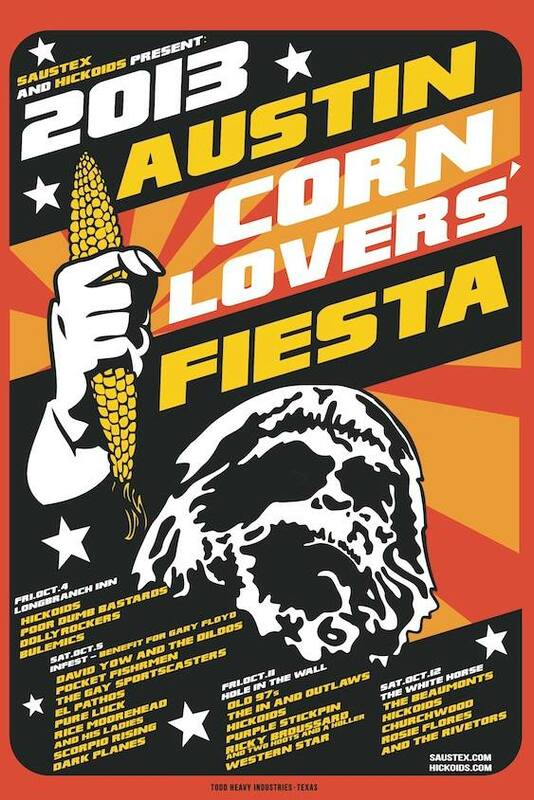 San Antonio based label Saustex and the Hickoids are pleased to announce the full lineup of the 2013 Austin Corn Loversʼ Fiesta, featuring The Old 97’s, David Yow fronting The Dicks rhythm section as The Dildos, Two Hoots and a Holler, Rosie Flores, The Beaumonts and a slew of other regional heroes. Not to be confused with another somewhat larger and similarly acronymed festival (hereafter referred to as the “other ACL”) that takes place in Austin during the same timeframe, The Austin Corn Loversʼ Fiesta offers unique differences and amenities (including Air Conditioning, Reasonably Priced Drinks, No $8 beer, Indoor Plumbing, Low Cover Charges). The floating club mini-fest, now in its fourth year seeks to present outsider roots and punk music in an intimate atmosphere. If you canʼt catch a picture of the band on your phone you ainʼt in the club! This is THE Austin that the rep was built on -- not the bloated, sweltering hipster wannabe episode of “Entourage” it has become. Hole In The Wall 2538 Guadalupe St.
Infest 213 W. 5th St.
Longbranch Inn 1133 E. 11th St. The White Horse 500 Comal St.
Coyote Music reviews recordings and live performances, publishes articles and interviews, and promotes musical artists through consulting, press releases, and concert promotion. Founded in 1995, Coyote Music thrives on its honest, positive approach, and experience working in most all facets of the industry. Submit your songs on SoundCloud or YouTube to Coyote Music via Fluence and get honest, professional feedback.